Traffic was non-stop at the Mickey NBWA booth, where attendees had a good look at the Party Time Event Trailer – inside and out. Beer wholesalers at the recent NBWA Convention in Las Vegas flocked to booth #207 to get an up-close look at the latest version of Mickey Truck Bodies’ Party Time Event Trailer, complete with new thermal efficient composite panels, large rear doors for forklift loading, and a Honda generator. Parked in the Mickey exhibit space on the convention floor, NBWA attendees could easily see how the Party Time unit would offer outstanding curb appeal at any type of event. 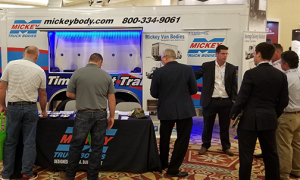 While wholesalers were in the Mickey booth to see the Party Time unit, they also caught up on the company’s latest features designed to improve driver productivity – the Mickey automated roll-up door and the E-Lock electronic door locking system. “With Mickey’s new E-Door and E-Lock, drivers can open, close, lock and unlock bay doors with just the push of a button. They will reduce workers’ comp claims and eliminate the problem of lost keys and frozen or broken locks,” says Gary.